Stepping foot into my local food co-op, New Pioneer Co-op, for the first time earlier this year made me feel alive again. Rainbows of local produce as far as the eye could see, a make-your-own nut butter station and a tall display of more spices, herbs and teas than I could imagine (even working at Frontier!). Grass-fed beef and cage-free eggs surrounded by towers of natural care products and organic snacks. A scratch bakery and sandwich bar that produced the most heavenly aromas. Passerby shoppers smiling and suggesting their tried-and-true favorites. 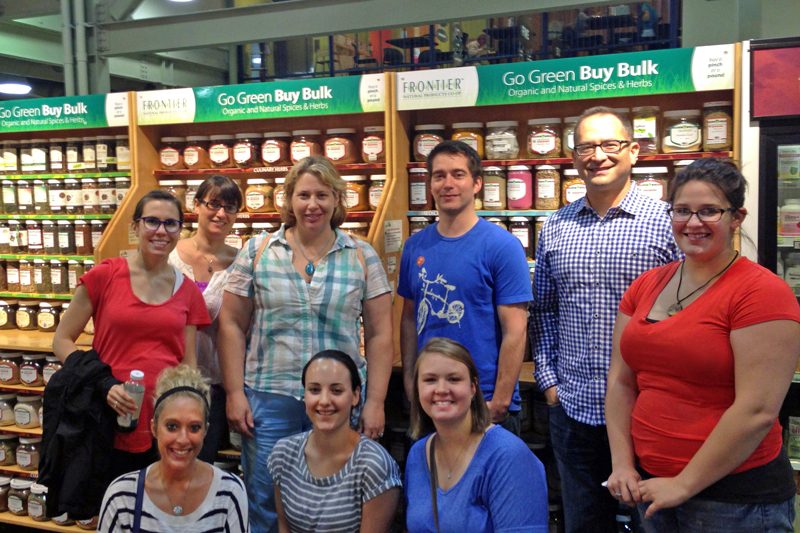 Stopping in front of the Frontier Co-op bulk display during our visit to New Pioneer Co-op earlier this summer. Food co-ops hold a whole new meaning for me now — community. Living in Iowa, we boast some of the world’s most fertile soil, yet, unfortunately, we are surrounded by genetically-modified crops and supermarkets filled with processed foods. Finding organic and locally-produced food is like searching for a needle in a haystack, unless you make it to the weekly farmer’s market, join a CSA or grow it yourself. Although supermarkets are striving to provide more organic and natural products, I discovered the day I visited New Pioneer why food co-ops are the go-to place and why that community is so special. When people ask me why I’ve stayed at Frontier Co-op so long (I’ve worked here more than 30 years), I tell them I enjoy working at a place that shares my values. And underpinning most of those values — such as our environmental and social responsibility, openness, integrity and fairness — is our cooperative business structure. I believe that being owned by our customers has been a key not only to our financial success, but to maintaining our values as well. And people seem to agree. We recently found that most people — from regular customers to those who have never heard of us — react very positively to our being a co-op and assume we conduct business fairly. Co-ops have a great image with the public. It’s something they’ve earned by, for the most part, reflecting the society-strengthening values of their cooperative owners. In most ways, cooperatives are like other businesses. Their facilities and equipment are much like those of their competitors and, to be successful, the businesses must be run well. Co-ops are even incorporated in most cases, filing papers with the state as a specially structured corporation. There are bylaws and other necessary legal papers. There is a board of directors that sets policy and oversees the management that runs the day-to-day operations. But co-ops are different in that they are owned and controlled (through the election of the Board) by members who have direct participation in the business. There are many types of co-ops, but often the participation is as a customer of the co-op — as it is with Frontier Co-op. Members of the co-ops collectively supply the capital the business needs and share its earnings. 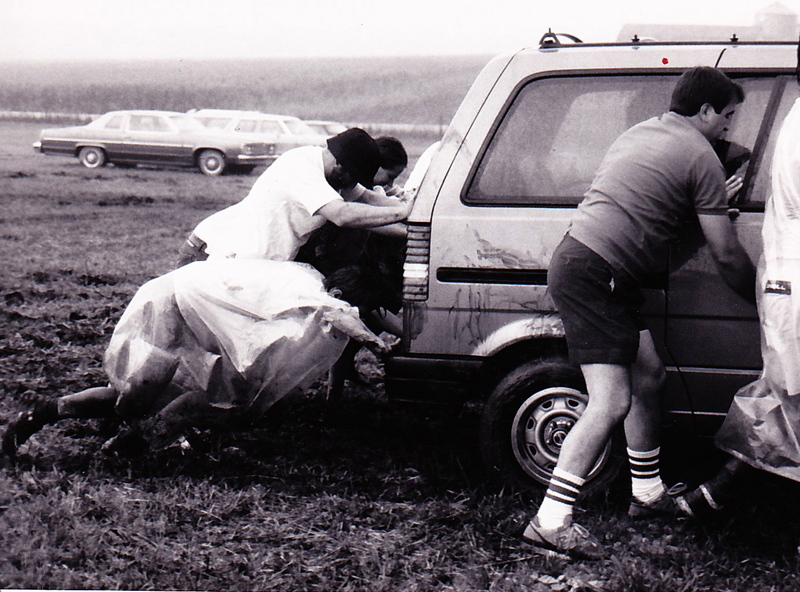 A surprise rainstorm made leaving the temporary parking area of our 1983 Member Meeting a cooperative effort — exemplifying what the co-op business structure is all about. 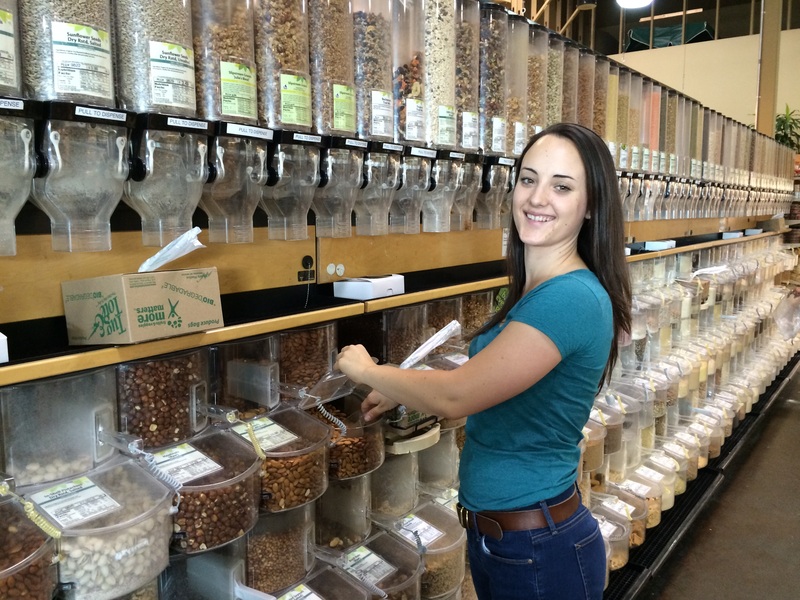 Digging in at the bulk bins at my own local co-op, New Pioneer Food Co-op in Coralville, Iowa. I didn’t always feel lucky to be raised by parents who were concerned about the importance of wholesome, ethically sourced food. My family lived in northeast Tennessee for the first ten years of my life, and we weren’t exactly surrounded by a booming community of people seeking to live “all-naturally.” I was likely the only one in my elementary school to have been born at home with the help of a midwife (whose small, organic farm we visited often), and certainly the only one whose placenta had been planted under an oak tree in the front yard. While other kids in my neighborhood learned how to train their talking Furbies and went on exhilarating adventures with Mario and his brothers, I learned how to tell an earthworm from a grub worm and helped my mom with the deliveries for her cloth diaper service. When I went over to friends’ houses, I remember enviously browsing through what seemed like endless cupboards of delectable snack foods — Rice Krispies Treats, Doritos, Cocoa Puffs cereal and double-stuffed Oreos. At my house, we got organic carrot sticks and whole grain crackers with unsweetened peanut butter. I didn’t look forward to my turn to bring refreshments to share at school. Why couldn’t my mom just get that all-natural, homemade Pop Tarts just weren’t as good as the real things, coated in high fructose corn syrup and vanilla frosting, and oozing with artificial cherry filling?! 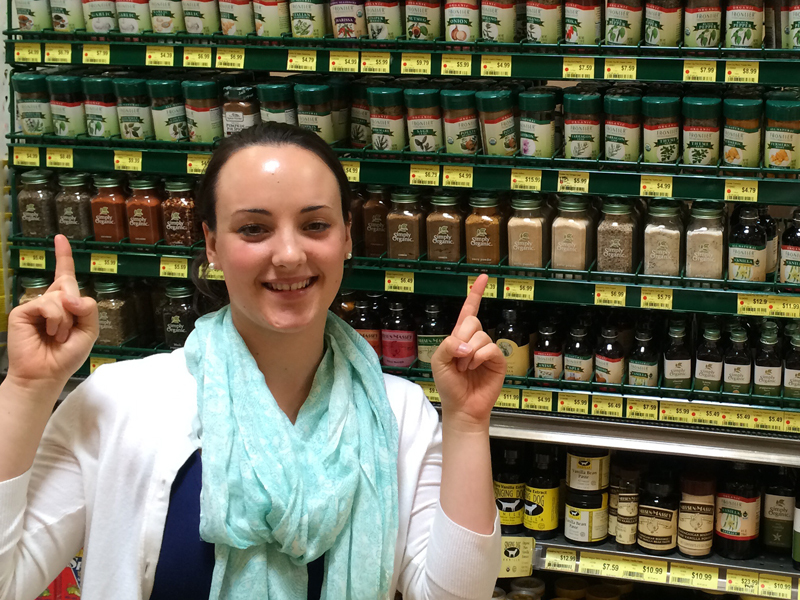 Pointing out my favorite spices during a visit to La Montanita Co-op in Santa Fe, New Mexico, this summer — proof that my family’s vacations always include at least one stop at a co-op! After working in conventional retail food stores for more than twenty years, my dad had accepted a position as general manager of La Montañita Co-op in Albuquerque. Although my parents had always been committed to making sure the house was stocked with nutritious food, they hadn’t previously been members of a co-op. I remember the first time I walked into La Montañita Co-op. Instead of the bright white floors and clean-cut symmetry of the conventional grocery stores, I was greeted by natural light streaming in through the large windows and a rustic, somewhat eclectic atmosphere of earthy colors and smells and light-hearted chit-chat between customers and employees. I can’t say this very first experience brought some sort of overwhelming tidal wave of awe over me. I was, in fact, quite skeptical. Where were the service clerks in their pressed white shirts and ties and bright white smiles? Where were the big yellow signs screaming for my attention, “SALE! SALE! SALE!”? Where was the brightly colored candy aisle with Reese’s Peanut Butter Cups and Skittles that never failed to trigger wide eyes and salivating cheek glands? And what on earth was all that food doing in huge plastic bins for people to just scoop out as they pleased?